It’s no secret that whether you’re cooking inside of your RV or outside over an open flame, herbs and spices are needed to make a meal complete. So today, we wanted to talk about a few RV accessories designed to keep the chef in the family well organized. 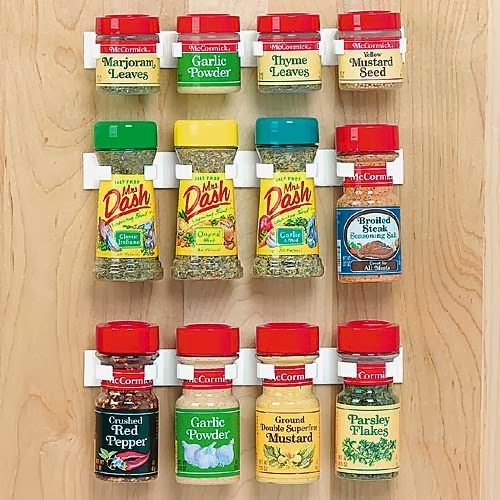 One of the most convenient RV accessories to incorporate into a kitchen is Spice Clips. As you might have guessed, they are ideal for keeping your RV spice collection in order. What we really like about this organizing system is the attachment system. The clips get affixed to the inside of your motorhome using 3M tape instead of nails or screws. So you don’t have to worry about permanently marring your motorhome’s interior in the name of organization. The 3M tape is very effective when it comes to holding the clips in place as well, we've had ours up for two years now and they are still perfectly in place. If your RV’s cabinets feature glass or otherwise see-thru facing, you may want to go with the Stayzz Kitchen/Bath Utility instead. It’s made of lightweight, self-adhesive, removable foam that’s designed to sit inside of a cabinet as opposed to hanging on a door or wall. This foam holder is capable of holding 11 spice containers that range in size from 2 to 3 inches in diameter. Of course all of those motorhome accessories are well and good if you are cooking indoors. So at this point you may be ready to ask “What’s an outdoor chef supposed to do?” In our experience, for that situation, you may want to consider buying a Camco Table Caddy, a see-thru container or a small,portable tote. The table caddy is large enough to hold the simple things such as salt, pepper and sugar. The portable totes and containers will clearly be able to handle much more than that. To learn more about these organizing rv accessories, please check the store or contact us at (866) 332-7881.